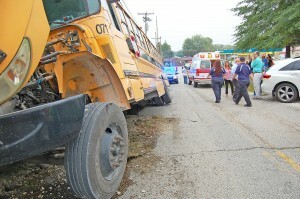 Five Lewis County students were taken to a Portsmouth, Ohio, hospital following an accident involving a school bus Monday morning. Deputy Gary Sparks said the accident happened about 7:45 a.m. as a school bus transporting 14 middle and high school students was traveling south on Ky. Rt. 1306 just off Ky. Rt. 8 in Garrison. Sparks said bus driver Teddy Thayer, 34, of Black Oak, reported an oncoming motorist forced him to steer the bus into the ditch and the front of the bus struck a driveway resulting in extensive damage to the vehicle.